A massive disturbance broke out at a Perth immigration and detention center Sunday night following the alleged attempted suicide of a detainee. A young male allegedly tried to kill himself at the Yongah Hill center and was taken to the hospital, according to the Australia Border Force. Early reports indicating that the man had died have since been proven incorrect. A spokesman for the Border Force said there was a "disturbance by a small number of detainees" prompting WA police and fire departments to respond. There were no reported injuries during the riots which began around midnight and went on until at least 4 a.m. EST. 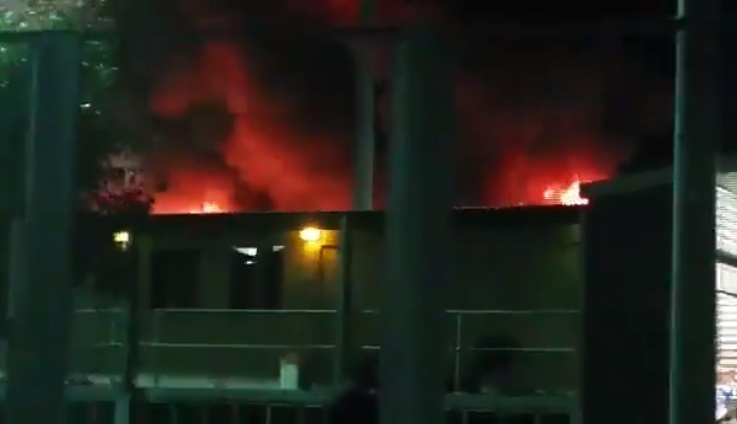 Video footage was posted to social media showing the inside of the detention center and a raging structural fire. There is also at least one person seen climbing over a high fence while detainees shout: "Shouldn’t the firies be here, helping them out?" One detainee was said a young man was sick all week. "He was so sick," he said. "They take him to the hospital, just give him blood and bring him back. Yesterday he was so angry and so tired." So the man got free medical care and was angry about being detained? The fires started sometime before midnight causing parts of the Falcon Compound to burn. Guards with dogs accompanied detainees out of the building and searched them one by one. Another detainee said, "They want to take us, I don’t know where. It was so scary." Others described the center as being overcrowded with mental health being a big problem since many inmates had no release dates or have been there for years. They described it as a "pressure cooker environment". The Border Force was allegedly warned of the riot by other detainees. "They were told by another detainee that this is what’s going to happen," he said. A total of around 150 detainees were relocated from the Falcon compound and sent to other parts of the center such as the clinic and segregation area. The department of home affairs said it would be conducting an investigation into Sunday night's events. "We are committed to ensuring the safety of those in immigration detention and will not tolerate violent and aggressive behaviour within IDCs," a spokesman said. "We will take all appropriate steps to stamp out such activity and if criminal offences have occurred, they will be referred to police."